Yorkshire Air Ambulance is flying high after the fund-raising feats of financial organization UK Asset Resolution (UKAR). UKAR is the holding company established six years ago to manage the closed mortgage books of Bradford & Bingley, Mortgage Express and NRAM. 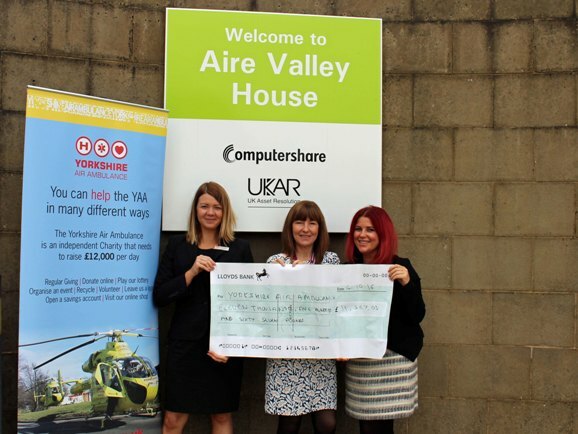 Over the last 18 months, UKAR staff at their Crossflatts office, near Bingley, have raised more than £11,500 after choosing Yorkshire Air Ambulance as their local charity. This brings the total raised by UKAR for the rapid response emergency service to more than £36,500. Alongside donations from monthly dress down days, staff also held a variety of events including a site to site cycle ride from their Sunderland office to Crossflatts, bake sales, tombolas and raffles with UKAR match-funding individual and group fund raising activities. Kerry Garner, regional fundraising manager for Yorkshire Air Ambulance, said: “We are extremely grateful for the tremendous support of UKAR and all their amazing staff. Yorkshire Air Ambulance serves 5million people across Yorkshire and carries out over 1,250 missions every year. The independent charity needs to raise £12,000 every day and is currently replacing its two ageing aircraft with brand new, state-of-the-art Airbus H145 helicopters. In September, the first of these went into service at the charity’s Air Support Base in Nostell, near Wakefield. It is hoped the second Airbus will be flying over the skies of Yorkshire before the end of the year. UKAR is responsible for around 215,000 customers holding £33.1 billion of mortgages and loans. UKAR Corporate Services Ltd, a subsidiary of UKAR, also administers the Government’s Help to Buy Mortgage Guarantee and Help to Buy ISA Schemes. In June this year UKAR outsourced its mortgage servicing, which saw approximately 1,700 staff move to Computershare Loan Services. UKAR now comprises of approximately 200 colleagues, mainly based in Crossflatts, West Yorkshire.